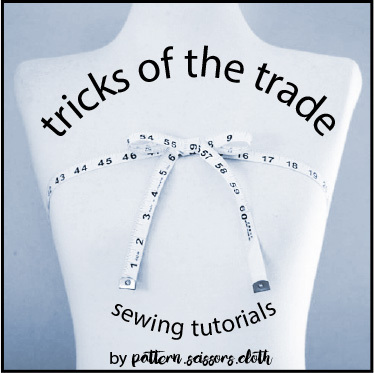 Welcome to 5 Sewing Tips for July – I’ve tried to make them as random as possible! A problem with many prints is that they are not accurately aligned with the horizontal grain, like the one below (the lengthwise grain alignment is usually fine). What to do? For a small all-over spot like this one, the off-grain print is not going to be that noticeable in the finished garment. In this case I ignored the print and cut following the grainline. Or you could always choose a bias cut pattern! We all know you should let bias skirts hang to ensure the finished hem is level, but did you know that you should also assess your side seams at this stage? If your side seams are curling to one side or flipping outwards at the hem, unpick them, allow them to fall naturally, and the cause will be revealed. In this instance one panel is a bit too short. Resew the seam in the position the fabric is telling you to and then trim the hem level. Hello perfect side seams! Do you struggle to get the edges of tucks to meet in the middle every time? The secret is to tack those soon-to-be-folded edges together first. Sew the foldlines together from the cut edge and a few stitches past the stitching line. Remove them once you’ve sewn the adjoining seam to reveal your perfectly meeting tucks! To stop going dotty when sewing collars – add more dots! Using a chalk pencil mark any pivot points 1cm in from each edge (or 1.5cm if that is your seam allowance width). So much easier to match those points while sewing! Did you know that double welt pockets with flaps are only 10 easy sewing steps away? Don’t believe me? Check out this tutorial showing you how. I hope you learnt something new from the archives this month! Any topics that you’d like me to mention in August? I seem to remember a post where you wanted to rotate a sleeve to make it sit better but I can’t find it anymore. Maybe it never existed!! Anyhow, my question is, should the grainline of a sleeve be exactly perpendicular to the floor, or should it follow the tilt of the arm? I would be grateful for your wisdom! I’m sure that is on the blog somewhere – I will dig it out and cover it in next month’s Sewing Tips! Another thing. I often notice in some fabrics that the warp and weft aren’t strictly perpendicular to each other but will be noticeably slanted. Is this on purpose or is it bad quality fabric? Whatever it’s purpose or cause, it’s going to cause your garment to twist and distort over time. It’s offgrain, and while you can laboriously pull it into grain, it may not stay there. Some digitally printing companies have a real problem with the original (griege) goods being offgrain to start. It’s just not worth the heartache. I am about to jump into making several men’s shirts, and the only part that I really dread about them is finishing the front edge of the colar stands. I can never settle on the best way to clip or fold the front corners of the seam allowance before trying to encase it inside the stand and top-stitch it closed. Especially when the stand is curved. Do you have any advice for this? This is a goodie! The front edge of the collar stand can make or break a shirt. I will definitely cover this topic soon – hopefully soon enough for your shirts! i love these posts! Thanks Sheryl!